After his plan to ban Muslims and his lauding of Muslims being shot en masse with bullets dipped in pigs blood, most Americans are likely not surprised by Trump’s most recent comments. But what Trump said likely resonates with many who view Muslims as anti-American. Which is why it’s necessary to break down what’s wrong with this prejudicial approach to Muslims and their faith. One of the chief errors in Trump’s remarks is the false dichotomy he made between “us”/the West/America, on the one hand, and “Islam” on the other. But Muslims and their religion are not wholly foreign, as Trump would lead us to believe. American Muslims are just as “American” as any other religious community. 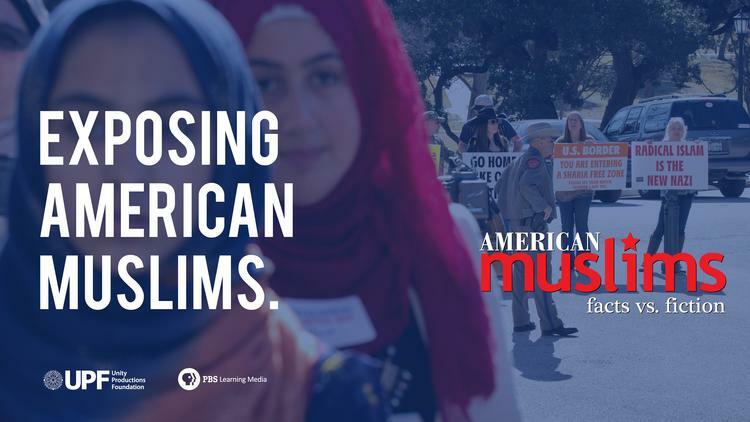 Data from Pew, which is featured in the Unity Productions Foundation short film, “American Muslims: Facts vs. Fiction,” shows that American Muslims are well integrated into the American mosaic. They watch professional sports on T.V., recycle their reusable materials, and are just as religious as Christian Americans. Forty-percent of American Muslims have college degrees (compared to 29% of the U.S. population overall), and Muslim women are statistically as likely as Muslim men to have college or post-graduate degrees. Muslims have been in America since before the country’s founding, many of whom were initially brought as slaves. About one-third of U.S. Muslims are African-American, and others are South and Southeast Asian, African, Arab, Latino, and white. Trump’s notion that Muslims are not a part of the American or Western “us” flies in the face of the facts about American Muslims. In his conversation with Cooper, Trump didn’t say that “Muslims hate us;” rather, he said their religious tradition — “Islam”— does. Many on social media quickly pointed out the flaw in this logic. 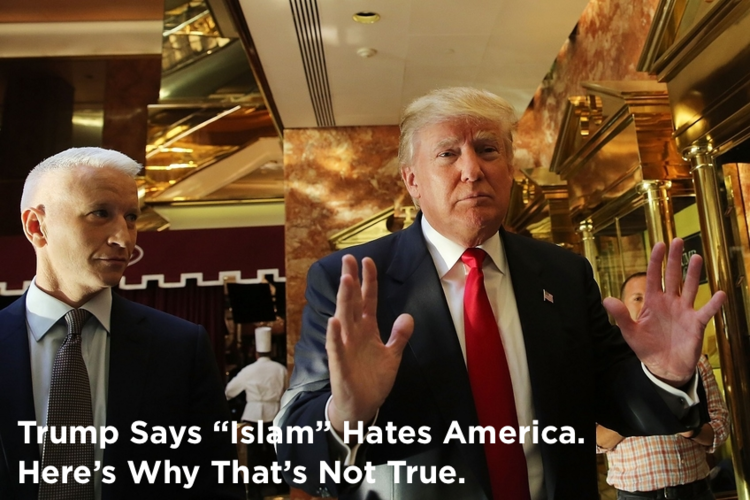 @CNN @realDonaldTrump Trump on CNN: "I think Islam hates us." Somebody educate this guy that "Islam" isn't a person. Omid Safi, the director of the Duke Islamic Studies Center, wrote, “apparently, something called ‘Islam’ gets up in the morning, brushes its teeth, puts its pants on, and then…‘hates us.’ Sheesh.” What he points out is that Islam is not a person. It has no thoughts and feelings — especially about America, which was founded about 1,200 years after Islam was. But do “a lot” of Muslims, the people who follow Islam, hate the West and other people who don’t share their faith, as Trump claimed? Public opinion polls in Muslim-majority countries often show that high percentages of residents have an unfavorable view of the United States, due to its foreign policy, its support for authoritarian regimes and failure to promote democracy, not because of a hatred of “our freedoms.” According to research conducted by Gallup and featured in the book Who Speaks for Islam: What a Billion Muslims Really Think, co-authored by the Bridge Initiative Director, John Esposito, anti-American feelings usually stem from how the U.S. has operated in Muslim-majority countries. But Muslims’ criticisms of U.S. foreign policy don’t mean they dislike Americans as people. Muslims, both in the U.S. and around the world, want the same basic rights and freedoms as most people, and want to help and contribute to their society. Some analyses estimate that one in 10 American doctors is Muslim, and health clinics run by Muslims abound throughout the country. American Muslims are artists and activists, and serve (and die for) their country in the military. Muslims raised money to supply clean water for residents of Flint, Michigan; to support the families of the victims of the San Bernardino shootings; and to rebuild numerous Black churches that were burned down last year. If Muslims hated America as much as Donald Trump thinks they do, would we see three million and counting who have dedicated their lives to helping make America, in Trump’s words, great?